Across the country, communities are embracing a new and safer way to build streets for everyone—even as they struggle to change decades of rules, practice, and politics that prioritize cars. They have discovered that changing the design of a single street is not enough: they must upend the way transportation agencies operate. Completing Our Streets begins with the story of how the complete streets movement united bicycle riders, transportation practitioners and agencies, public health leaders, older Americans, and smart growth advocates to dramatically re-frame the discussion of transportation safety. Next, it explores why the transportation field has been so resistant to change—and how the movement has broken through to create a new multi-modal approach. In Completing Our Streets, Barbara McCann, founder of the National Complete Streets Coalition, explains that the movement is not about street design. Instead, practitioners and activists have changed the way projects are built by focusing on three strategies: reframe the conversation; build a broad base of political support; and provide a clear path to a multi-modal process. McCann shares stories of practitioners in cities and towns from Charlotte, North Carolina to Colorado Springs, Colorado who have embraced these strategies to fundamentally change the way transportation projects are chosen, planned, and built. The complete streets movement is based around a simple idea: streets should be safe for people of all ages and abilities, whether they are walking, driving, bicycling, or taking the bus. Completing Our Streets gives practitioners and activists the strategies, tools, and inspiration needed to translate this idea into real and lasting change in their communities. Barbara McCann is the director of the Office of Safety, Energy and Environment at the US Department of Transportation. She was the founding Executive Director of the National Complete Streets Coalition, working with groups from AARP to the YMCA to develop and advance the adoption of policies to make streets safe for all users. More than 500 jurisdictions, including more than half the states, have now adopted Complete Streets policies. McCann co-created the Complete Streets Workshop program and speaks widely. In 2011 the NY/NJ Section of the Institute of Transportation Engineers recognized her with the 2011 Transportation Advancement Award, given annually to a non-engineer "for contributions in advancing transportation programs through outstanding leadership." Barbara founded McCann Consulting in 2003 to work with government agencies, non-profits, and researchers, authoring numerous reports and articles on transportation, health, and land use. McCann is also a co-author of Sprawl Costs. Prior to establishing her own firm, McCann served as Director of Information and Research at Smart Growth America (SGA) where she authored the report Measuring the Health Effects of Sprawl, the first research report documenting the relationship between sprawl and obesity. She worked at CNN as a writer and producer for 13 years during her first career as a journalist. She lives in Washington, DC with her husband Bob Bloomfield. "It's hard to overstate how fundamental a change the [Complete Streets] movement has wrought in the way we think about such an important part of our communities. This is an important success story, containing many individual success stories within. 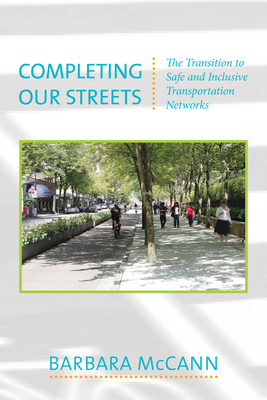 Written by the movement's founder and leader (who also happens to be a very good writer), Completing Our Streets is now the definitive book on how communities can work together to make streets safe for all users." "New urbanists — and public officials, and transportation professionals — need McCann and the complete streets movement. Not only because their policies aid in improving our nation's public realm and transportation system, but also to learn from the communication skills, strategic thinking, and sheer coalition building power of McCann and her colleagues. Read Completing Our Streets and find out how she does it." "I would describe this book as a must-read for planning professionals, elected officials and anyone with an interest in sustainable road systems. You will be glad you did." "Author Barbara McCann has produced a thoughtful and forward-looking study showing how cities can transition to building or re-configuring safe and inclusive transportation networks." "This valuable book shows how to bridge the gap between complete-streets policy and implementation." "As a former CNN journalist with in-depth knowledge of the multidisciplined transportation system, [McCann] can as readily write about design and traffic signaling as about transport funding, politics, maintenance, and visioning. With ease, she discusses procedural, behavioral, political, and educational issues, including how they play out at different levels of government…a worthwhile contribution to the planning field." "McCann's writing recognizes the common disconnect between vision and implementation of complete streets, and highlights how it is possible to make positive change in a less-than-ideal environment. Her book is a call to action for interdisciplinary cooperation in balancing the important physical, cultural, and policy changes necessary to reach complete streets." "Transportation policy is health policy, and complete streets are as much a public health strategy as vaccinations or water treatment. In this short, wonderful book, Barbara McCann describes how communities have moved from concept to practice, enabling people to get from place to place in safe, healthy, environmentally friendly, and efficient ways." "Barbara McCann gives us an amazing how-to resource for enhancing our streets to make our communities safer, healthier, and more people-friendly. Whether you are a practitioner or a resident, her eye-opening examples from across the US will make you want to roll up your sleeves." "Creating streets that work for everyone, not just drivers, is far more complicated than good design. In sharing her keen insights into the experiences of communities that are bucking the long-standing auto-centric approach to transportation planning in the US, McCann offers a promising way forward." "This book shows not just what to do, but how to create a shared sense of stewardship for our streets and enlist everyone in building something great. This is the kind of progress that endures."